A seemingly endless procession of low pressure systems traversed the North Atlantic during the first three weeks of July, resulting in yet more persistent cool, wet and often windy weather. High pressure did start to build in the fourth week, producing some ideal warm moth-trapping nights from about the 25th. Although unsettled weather returned at the end of the month, it was usually accompanied by a southerly element to the wind direction. This in turn aided moth migration and kept night-time temperatures in the mid-teens through the first ten days of August. Highlights included a flurry of rarer hawkmoths, a series of scattered scarce migrants and the mainland's fourth ever The Latin on the night of 10th August. 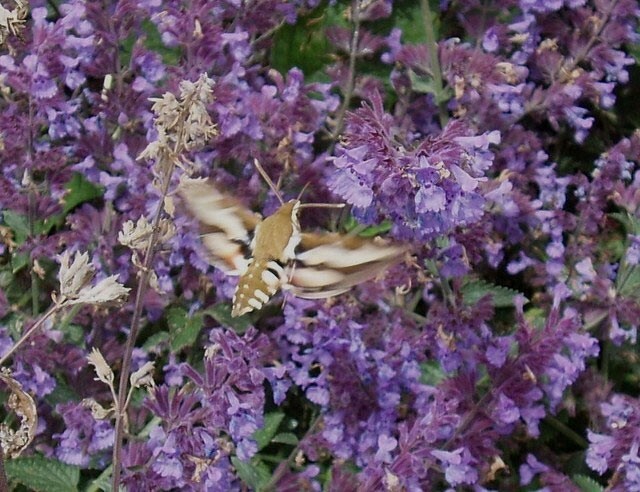 Six Striped Hawkmoths included three in Somerset in just two nights on 2nd and 3rd July. No fewer than eight migrant Bedstraw Hawkmoths during July had a more northerly distribution, with individuals reaching as far as Ardivachar, South Uist (Outer Hebrides) on 25th and the Isle of Man on 7th. Others included two in East Yorkshire, one at Burn Moor (Lancs) on 24th and one photographed by chance, nectaring on flowers at Howick Hall (Northumberland) on 17th. Bedstraw Hawkmoth, Burn Moor (Lancs), 25th July (Gary Jones). 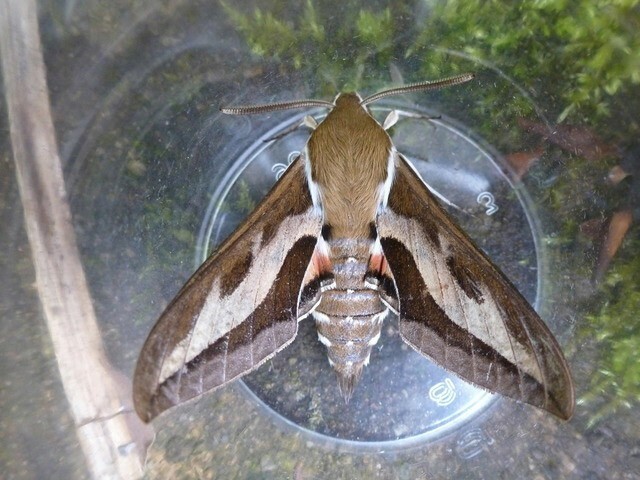 Bedstraw Hawkmoth, Howick Hall (Northumberland), 17th July (Sue Leeming). A single Convolvulus Hawkmoth was at Sandwich Bay (Kent) on the 13th July and around 44 Hummingbird Hawkmoths were reported across the country. A rather unexpected Stephen's Gem on St. Mary's (Scilly) on 12th July was the first in Britain for a decade and follows a previous one there on 9th July 2002. Whether it was a true trans-Atlantic vagrant or an arrival from an unknown breeding population closer to home will continue to be the subject of debate. 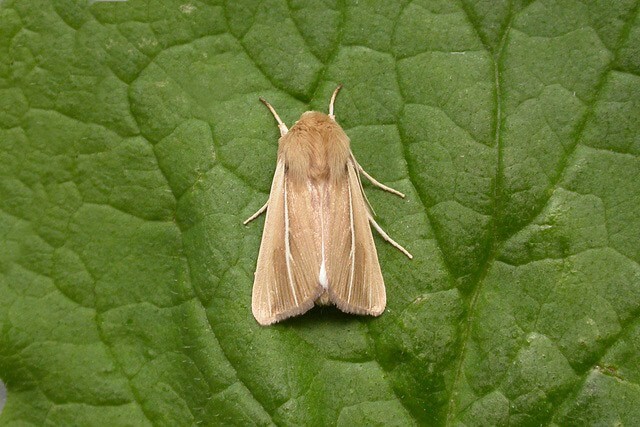 Other 'Plusias' included a Golden Twin-spot at Ramsgate (Kent) on 27th July and four more Dewick's Plusias. 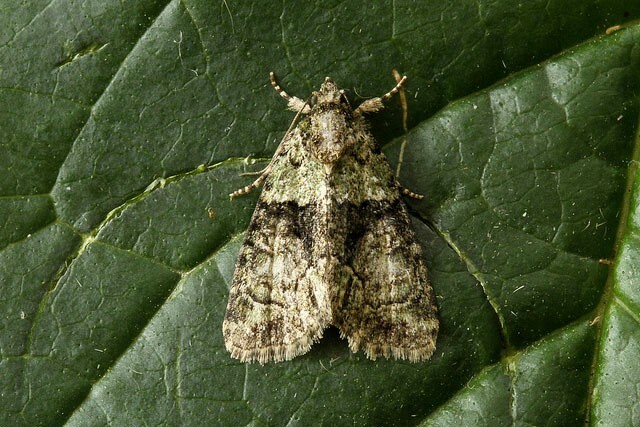 A fine Orache Moth was at Sandwich Bay (Kent) on 5th July, followed by a Silver Barred there the next night. 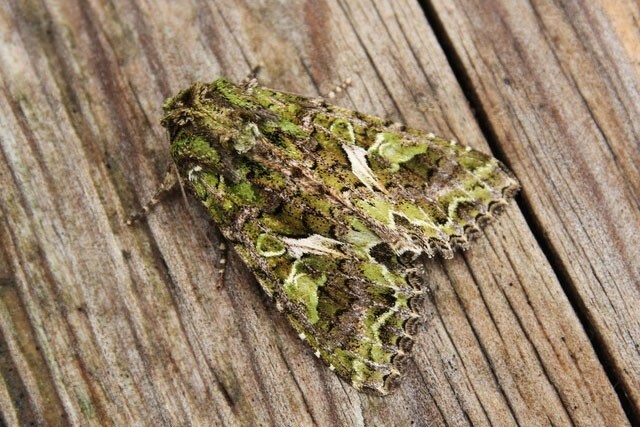 Orache Moth, Sandwich Bay (Kent), 6th July (Ian Hodgson). 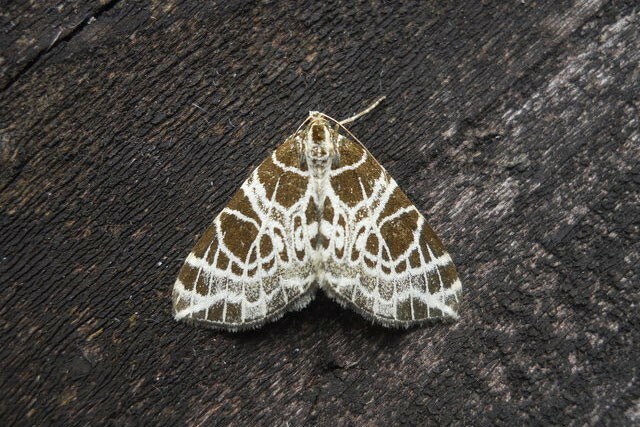 The east coast of England held its own in July with a Bright Wave at Dunwich (Suffolk) on 5th, followed by The Many-lined at Withernsea (E Yorks) on the 10th and another at Ipswich (Suffolk) on the 17th. The Many-lined, Ipswich (Suffolk), 18th July (Neil Sherman). The Latin, Bracklesham (W Sussex), 12th August (Roger Wasley). Tree-lichen Beauty, Bracklesham (W Sussex), 12th August (Roger Wasley). The more regular scarce migrant macros were only recorded in low numbers but included three Gems, 37 Dark Sword-grass, six Pearly Underwing, three Delicate and six Bordered Straw. Silver Ys were widespread and abundant in places, with the largest sample recorded being 134 in a single trap on a Black Mountain (Powys) survey on 2nd July. Yet another migrant pyralid Loxostege sticticalis (1368) was found at High Eske NR (E Yorks) on 9th July. A Metalampra italica (642a) found at Glasbury (Powys) on 31st July was well away from its presumed tiny resident colony at Saltwood (Kent). What appeared to be a strong influx of the migrant tortrix moth Cydia amplana (1262) got under way in early August with a few records from Dorset and Hampshire; this seems bound to increase as we head through the rest of August. Diamond-backed Moths were also widespread, the highest sample count being 55 at Portland Bill (Dorset) on 26th July. Other migrant micros included two Vine Moth (955), 15 Evergestis limbata, 54 Rush Veneer and 22 Rusty Dot Pearl. A Long-tailed Blue butterfly of unknown origin was at East India Dock (London) briefly on 10th August. The only other migrant butterflies were a Clouded Yellow on Swanborough Hill Nature Reserve (E Sussex) and just eight Painted Ladies, mainly in southern counties. The main Odonata highlight was the increase in numbers of the Southern Migrant Hawker dragonfly at three reserves on both sides of the Thames Estuary, while Willow Emerald Damselflies reached the Cambridgeshire Fens near Sutton Gault. Elsewhere there were migrant Lesser Emperor dragonflies at eleven sites and Red-veined Darters at a minimum of nine. Raspberry Clearwings were confirmed as having bred in Essex at Great Dunmow on 25th July, while nearby in Hertfordshire nine showed well to a pheromone lure at a 'pick your own' farm shop on 28th. Raspberry Clearwing, Hertfordshire, 28th July (Steve Whitehouse). Dotted Rustic appears to have re-established itself as a scarce breeder in the Home Counties this summer, with no fewer than five in Bedfordshire since late June and several others in the region. Individuals on the Suffolk and Kent coasts were probably migrants. Dotted Rustic, Bedfordshire, 10th July (Melissa Banthorpe). 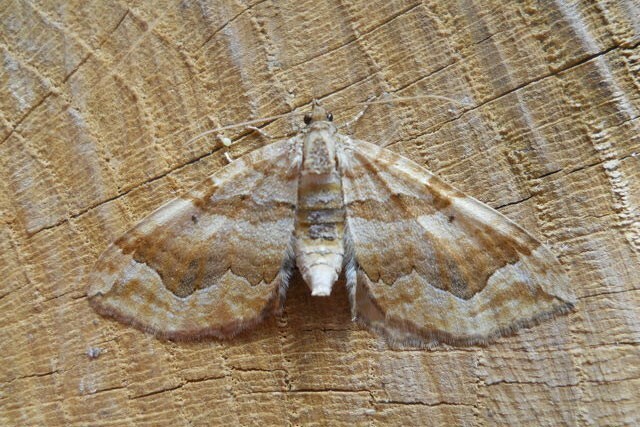 Three Goat Moths to light traps at Formby Nature Reserve (Lancs) in early July were of note and were quickly followed by a male to a pheromone lure placed inside a trap at Earith (Cambs) on 16th. 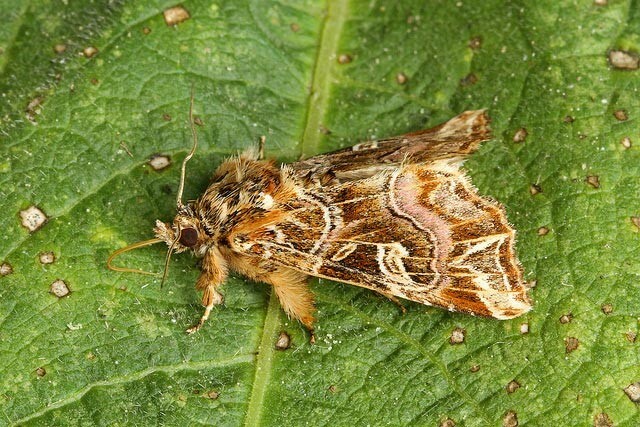 Fears for the future of Yorkshire's Red Data Dark Bordered Beauty following an autumn fire which destroyed much of the creeping willow foodplant last year were allayed when 14 were counted in the area on 20th July. It is hoped that the wet summer this year may actually increase habitat regeneration and long-term prospects for the moth. Male Dark Bordered Beauty, Yorkshire (David Baker). 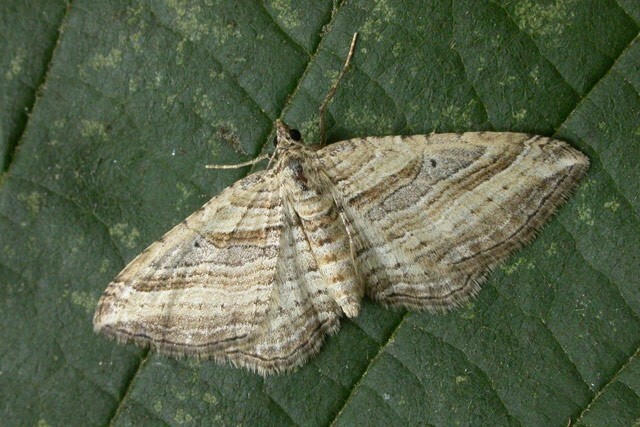 The cool summer also delayed the emergence of the Red Data species Netted Carpet at its only Lancashire site. However a count of at least 16 on 8th August showed that it and its foodplant (yellow balsam) were still flourishing, following some simple low-key management at the site. Netted Carpet, Lancashire, August 2012 (Steve Whitehouse). Wandering Royal Mantles reached the Cambridgeshire Fens: a single was in Peterborough on 23rd July and another three days later in Ely. It seems Scarce Burnished Brass may have had a good July in Glamorgan, where extralimital records included one at Nantyffyllon — new for the Llynfi Valley — on 22nd, one at Gorseinon on 24th and another the next night at Caswell Bay. Scarce Burnished Brass, Nantyffyllon (Glamorgan), 23rd July 2012 (Paul Parsons). A Crescent Striped was new for the reserve at Slimbridge (Glos) on 18th July and perhaps reflects the quality of the advancing area of saltmarsh on this part of the upper Severn Estuary. A Satin Beauty was new for the Outer Hebrides: one was at Langness, South Uist on 20th July. Somewhat surprising was a confirmed Northern Arches at Cathkin Marches SWT (Clyde) on 23rd July. There has also been some good news for Wainscots this summer. Two White-mantled Wainscots were discovered in Norfolk for the first time ever on 31st July, giving further evidence that it is spreading north. Healthy colonies of Silky Wainscot and Southern Wainscot were confirmed in reedbeds at East Chevington NWT (Northumberland) on 8th August. Silky Wainscot, East Chevington NWT (Northumberland), August 2012 (M.S. Hodgson). On the Northumberland coast, Tom Tams had several Shore Wainscots in his Tynemouth garden in early August. Shore Wainscot, Tynemouth (Northumberland), August 2012 (Tom Tams). 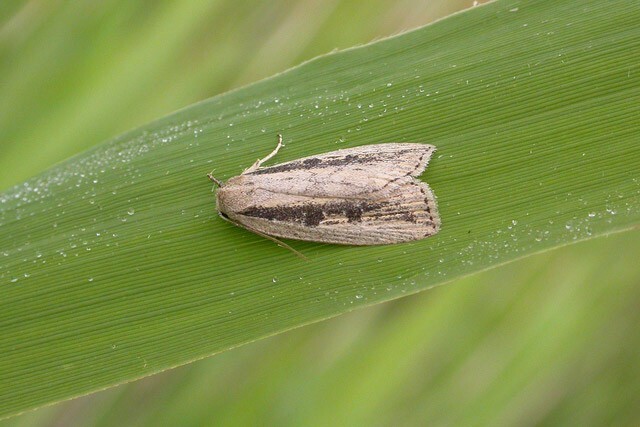 Recently very scarce in most of England, Garden Darts have surfaced in at least five counties in recent weeks. Both Barred Rivulet and Dark Spinach seem to have had good seasons. Dark Spinach, Pentney (Norfolk), 4th August 2012 (Steve Whitehouse). The rarest micro moth discovered was the second British record of the attractive Harpella forficella in mid-Sussex on 27th July. 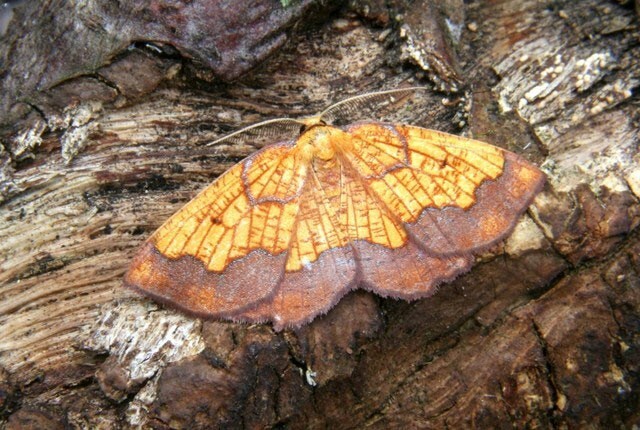 This moth is common across the English Channel in Belgium and its larvae feed under the bark on decaying wood. The recent rare colonist Bisigna procerella (639), known only from a handful of records in Hamstreet Woods (Kent) was trapped at nearby Aldington on 9th August, which may indicate that it is slowly spreading from this tiny core population. Bisigna procerella, Aldington (Kent), 9th August 2012 (Bernard Boothroyd). Another very interesting-looking and local moth Stathmopoda padella (877) came to light at Paddock Wood (Kent) on 4th July. This was followed by one trapped at Framwellgate Moor (Durham) on 24th, the first record for VC66, and another was at found by day, recently emerged on grey alder cones at Grimley (Worcs) on 2nd August. 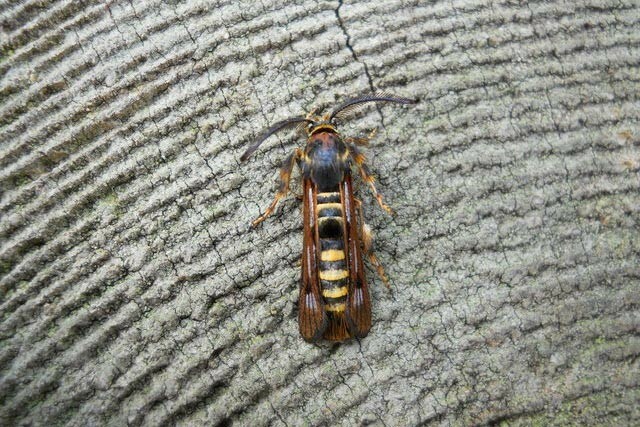 Stathmopoda padella, Framwellgate Moor (Durham), 25th July 2012 (Keith Dover). 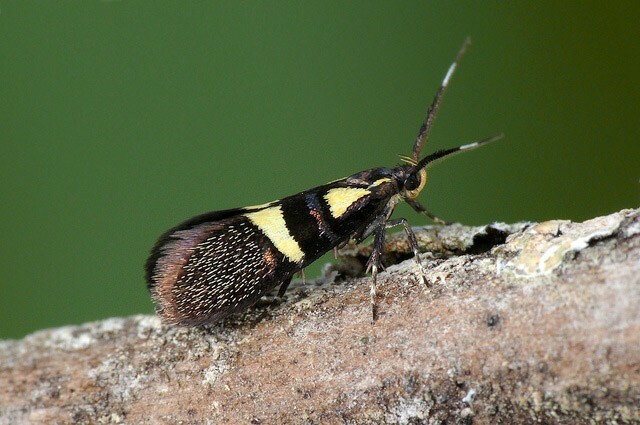 The Wyre Forest Study Group had an excellent day in the Worcestershire section of The Dowles on 14th July, spotting no fewer than three adult Dasycera oliviella (650) in flight around deadwood in mid-afternoon. 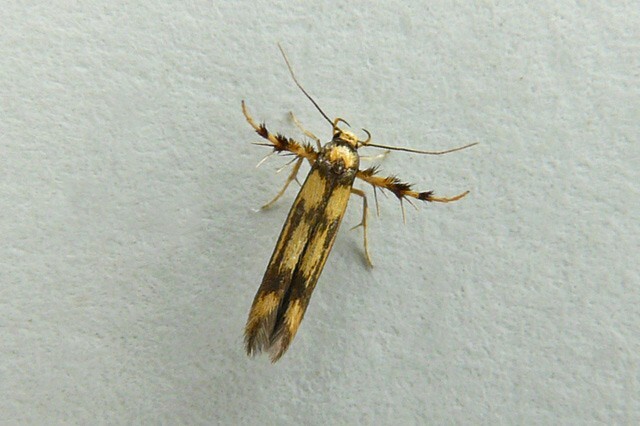 Dasycera oliviella, Wyre Forest (Worcs), 14th July 2012 (Oliver Wadsworth). 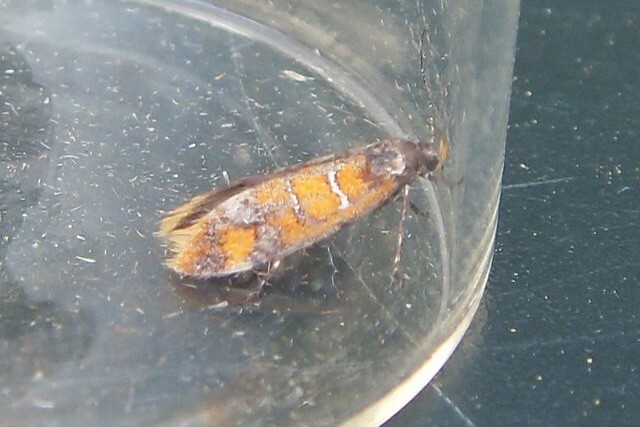 Other notable micros were the second record of Ethmia quadrillella (719) for VC32 in Peterborough (Cambs) on 4th July. In Glamorgan, there was the local plume Oxyptilus parvidactylus (1490) at St. Brides Major on 8th July. This was the first in the county since 1979 and was followed by a Cochylidia rupicola (959) at Gwaelod-y-Garth on 31st July — last seen in the county in 1937! The smart tortrix Grapholita lobarzewskii (1249) has now reached Staffordshire, with one photographed at Penn on 24th July. 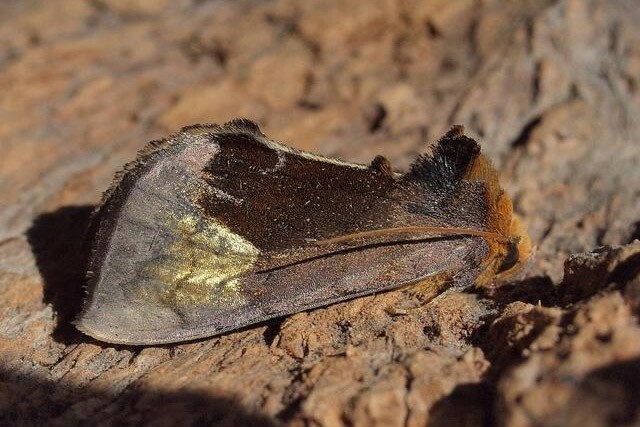 Famously known only to be self-supporting on the Isles of Scilly, the Yellow V Moth (277) was discovered in Cumbria in early August when two adults were seen flying around the base of a tropical palm at a plant nursery at Staveley. It will be interesting to see whether this colony can survive this far north. Townsend and Lewington. Field Guide to the Moths of Great Britain and Ireland. Revised edition, British Wildlife Publishing, 2009. 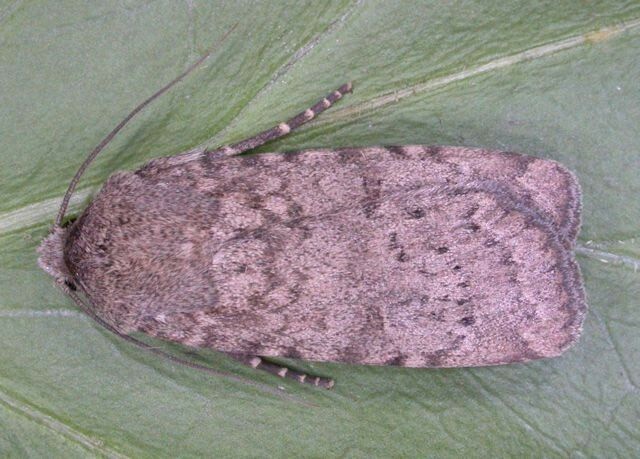 * The numbers stated after a number of micro moth species in the text are the British Checklist Species numbers as assigned by J. D. Bradley in the Log Book of British Lepidoptera (2000).